Accueil Actualité Articles Politiques Jordanie Jordan's Club .. Among all the strange and curious sights in the Middle East is the appearance of a new political clique here that is attracting record membership. Its members are often seen at the heart of Amman’s glittering social whirl, and although they are invariably household names, their past looks decidedly more thrilling than their future. In political terms they are, quite literally, the quick and the dead. They are the rapidly expanding club of former ministers of King Abdullah II — several hundred, by some estimates — who came to the well, drank as best they could and were then sent home to think about what they’d done wrong. They sign on for just a limited season, aware that they are scapegoats in suits, cloned to take the rap whenever another palace policy bites the dust and the public demands fresh blood. So there are currently few incentives for climbing Jordan’s political tree. The average career expectancy of a prime minister has fallen to around eight months — hardly long enough to give birth to a cogent thought, let alone an innovative policy. Imagine the hapless head of government, all but dead on arrival in his office, staring disconsolately day after day at his telephone, wondering only when someone will be instructed to call him a cab. Ludicrous thought? Perhaps. But the swift demise of three governments in the last two years, nine since King Abdullah mounted the throne, would tend to support such an image. Jordanians are unimpressed. We are on the brink, say many, of nothing good. One former official, says the king is desperately short of friends. To be frank, humiliation is relative. Some ministers were sent packing with handsome payoffs — four or five cars, a generous slab of land and a grand mansion. And yet in this part of the Middle East, dignity is still more highly prized than bling. and several ousted ministers claimed the palace had insulted them not just to their face but behind their back as well. For now, the club of the once-powerful is collectively shaking its head at the king’s loss of authority at home and his diminishing international status. One member likened him to Scheherazade in “One Thousand and One Nights” who had to keep telling stories to prevent her head being cut off in the morning. 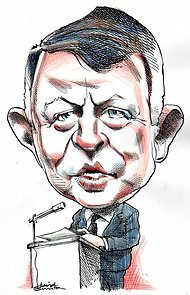 What may save King Abdullah for a while are the almost endemic divisions among his critics and the lack, so far, of any visible alternative. But there is widespread agreement that the Islamists — buoyed by success in Tunisia and Egypt — will increasingly call the shots in Jordan and other Arab states. But the real changes in this region are about more than personalities. The fact is that the Arab revolutions have kicked a gaping hole in the world’s most intricate diplomatic puzzle — a set of incredibly complex alliances, threats, illusions and understandings that has somehow prevented the Middle East from destroying itself for half a century — and it now urgently needs to be rebuilt. Jordan’s ex-statesmen don’t have to live in the Holy Land to read the writing on the wall. They know that Washington is only interested in the new winners. What some also acknowledge is that if King Abdullah were seen to be obstructing Washington’s new relationships, and if his face no longer fitted, the United States might simply let him fall by the wayside. Between the Ides of March and the Arab Spring is a bad place right now. Tim Sebastian is chairman and founder of The New Arab Debates. A version of this op-ed appeared in print on December 10, 2011, in The International Herald Tribune with the headline: Jordan's Club of Has-Beens.